Wacipi means “they all dance” in the Dakota language. Dance has always been an important part of our ancestors’ ceremonial practices. The Wacipi, or Pow Wow, is a celebration of life. Native Americans gather for a cultural and social celebration of dancing, singing and visiting. This is a time when Native Americans gather to meet old friends, make new ones, and honor those who have come before them. A time to gather, share, reflect and thank the Creator. It was originally a gathering time held at the end of a season to celebrate a good hunt or recognize a positive event. There, Indian people would dance to entertain, but the dancing was originally a part of ceremonial practices and used to tell tribal stories. Visitors are welcome to enjoy the whirl of colors, sights and sounds of our annual Wacipi. From the inspiring rhythms of the drum groups to Native American dancers in full regalia, we invite you to share in our culture. The SMSC Wacipi begins with a blessing of the dance circle. This is followed by the Grand Entry with the Veterans Color Guard carrying in the flags and eagle staff, followed by visiting dignitaries, tribal royalty, and the dancers. Once the dancers have entered the circle, a prayer is said, and attendees are asked to stand and remove their hats as the drum group sings songs to honor the flag and the veterans. Contemporary Wacipis have begun to incorporate Wacipi Royalty. The selected youth dance to represent their respective tribal nations, acting as ambassadors for their people. The 2018-2019 SMSC Royalty includes Brave Tony Brewer, Princess Summer Lemke, Junior Brave Trystan Brandt-Dedeker, and Junior Princess Celianna Thomas. The SMSC Royalty is selected earlier in the year at the Wakaneza Wacipi. 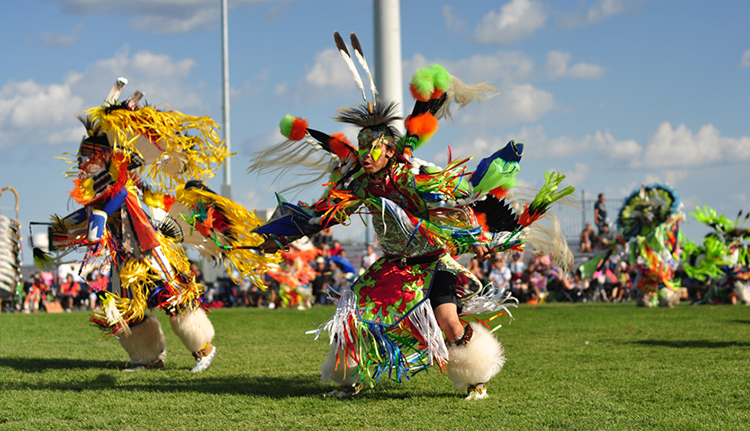 Today, the SMSC’s Wacipi is a contest Pow Wow, where dancers compete in dance categories and age groups, including tiny tots, juniors, teens, junior and senior adults, and golden age. The Master of Ceremonies, called “Wapaha,” calls for intertribal dancing, allowing everyone to dance together. There are exhibitions and contests throughout the three days, including dance categories, such as Men’s Fancy, Jingle Dress, Fancy Shawl, and Golden Age, among others. Drum groups are invited to participate in our Wacipi as well. Specials: Throughout a Wacipi, honorary dances and ceremonies called “Specials” are integrated, usually celebrating a specific individual. Fallen Warrior Ceremony: If an eagle feather falls to the ground, an Eagle Feather/Fallen Warrior Ceremony is held for veterans to retrieve the Fallen Warrior. The SMSC has the highest respect for “wambdi,” the eagle. The eagle flies higher than any other being and carries prayers to the Creator. Possession of an eagle feather is an honor; they are usually received as a gift from a relative, spiritual teacher, or from the eagle himself. Please, no photography during this ceremony. Giveaway: A Giveaway is a tradition when someone has been honored or a major accomplishment is reached. The Master of Ceremonies announces the purpose of the Giveaway, and then simple, everyday gifts are given to the honoree. Blankets and special gifts like star quilts are given to individuals who have helped the family. Visitors are sometimes given small gifts as well. It is considered impolite to refuse a gift if given. A Giveaway is generally followed by a “Wopida” (thank you) song and dance, where everyone who has received a gift is invited to participate in a round dance. Naming Ceremonies: Naming Ceremonies are used when families want to give a spiritual or “Indian” name to an individual. A spiritual leader or respected elder performs this ceremony, and usually a Giveaway and Honor Song follow. Please, no photography during this ceremony. A memorial Honor Song recognizes someone who has passed away in the last year. The SMSC Wacipi Grounds are located just north of Mystic Lake Casino Hotel and south of County Road 42, between county roads 83 and 17 (Marschall Road). The SMSC Wacipi Grounds provide ample parking. Golf carts are available at no charge to transport guests from the parking lot to the grounds. Please give priority to elderly guests and those who may need extra assistance, such as families with small children. The Arena has a grassy, sacred middle area, blessed for the gathering. This area should be treated like a church. Do not smoke, travel through, or allow children to play in it.